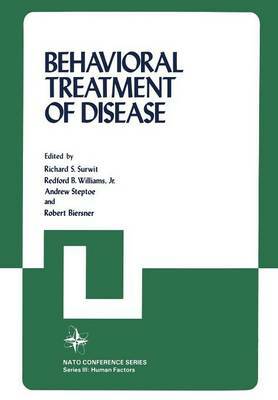 Behavioral Treatment of Disease: A NATO Symposium on Behavioral Medicine was held on June 30th through July 3rd, 1981 at Porto Carras, Neo Marmaras, Greece. It was a multi- disciplinary meeting which provided an opportunity for North American and European scientists from ten different NATO member countries to share the emerging principles and technology of behavioral treatment of disease. In addition, it served as a forum whereby continued high level research in the area was stimulated. Financial support for the symposium was initially provided by the Scientific Affairs Division or the North Atlantic Treaty Organization as part of their continuing seri.es of scientific symposia. Funds made available by a grant from the United States Office of Naval Reseach permitted widespread inter- national participation in the symposium. We would like to thank each of these organizations for their support in making the symposium possible. In particular, we would like to thank Dr. B. A. Bayraktar of the Scientific Affairs Division of NATO and Dr. Donald Woodward of the U.S. Office of Naval Research. Though both of these men were unable to attend the meeting personally, they provided invaluable assistance in its planning.